A landmark survey of Irish history, "The Cambridge History of Ireland" (Cambridge University Press) presents the Irish story – or stories – from c. 600 to the present. 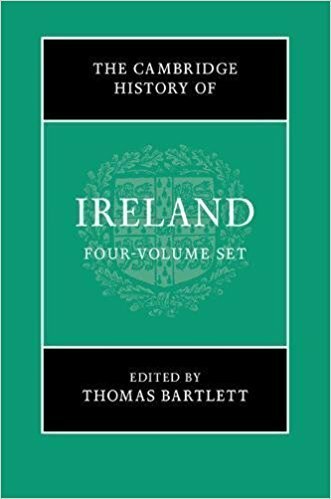 Four comprehensive volumes bring together the latest scholarship, setting Irish history within broader Atlantic, European, imperial and global contexts. Two University of Notre Dame faculty members are contributing authors to this landmark series. Patrick Griffin, Madden-Hennebry Professor of History and Director, Keough-Naughton Institute for Irish Studies, wrote a chapter titled, "‘Irish’ Migration to America in the Eighteenth Century? Or the Strange Case for the ‘Scots/Irish,’" in volume III. Brian Ó Conchubhair, associate professor of Irish language and literature and director of the Center for the Study of Languages and Cultures at Notre Dame, wrote an article titled, "The Culture Wars: The Gaelic League and Irish-Ireland," in volume IV. The Keough-Naughton Institute for Irish Studies has joined with Cambridge University Press and the Trinity Long Room Hub to sponsor a seminar on Monday (April 30) and then a celebration at Dublin Castle in the evening, with President Michael D. Higgins offering a special address. The first volume of "The Cambridge History of Ireland" presents the latest thinking on key aspects of the medieval Irish experience, focusing on the extent to which developments were unique to Ireland. The openness of Ireland to outside influences, and its capacity to influence the world beyond its shores, are recurring themes. Underpinning the book is a comparative, outward-looking approach that sees Ireland as an integral but exceptional component of medieval Christian Europe. Volume II looks at the transformative and tumultuous years between 1550 and 1730, offering fresh perspectives on the political, military, religious, social, cultural, intellectual, economic and environmental history of early modern Ireland. As with all the volumes in the series, contributors here situate their discussions in global and comparative contexts. The final volume covers the period from the 1880s to the present. This insightful interpretation on the emergence and development of Ireland during these often turbulent decades is copiously illustrated, with special features on images of the "Troubles" and on Irish art and sculpture in the 20th century. Originally published by Mary Hendriksen at irishstudies.nd.edu on April 30.